I am evaluating iSpring. Very good so far. I am publishing the presentation with the "Combined (HTML5 + Flash)" option. 1. Is it possible to customize the cursor? 2. 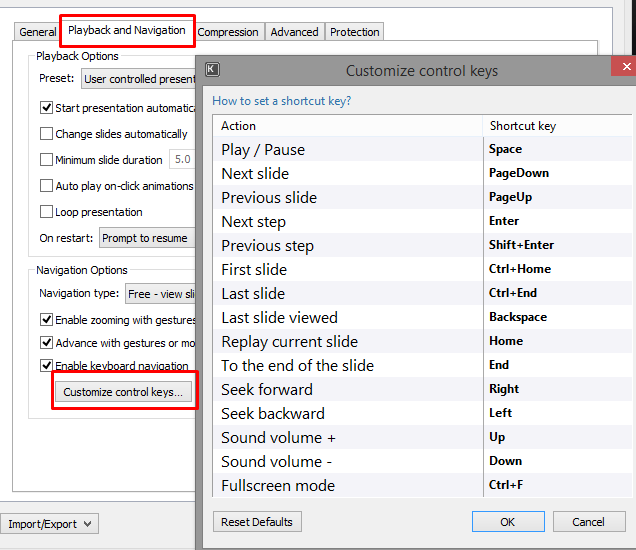 Is it possible to have the mouse right-click act as "previous slide" (disabling the default context menu)? 3. Is it possible to modify the folder name? Now it is something like "name-of-presentation (Web)", but I'd prefer "name-of-presentation-web" or (better) just "name-of-presentation".. Appreciate your interest in iSpring authoring tools! I regret to say this, but the mouse cursor and context menu are not controlled by iSpring. That is why they can not be changed/disabled. Also, the .js and .css files are created programmatically by the authoring toll and it not recommended to edit them. Otherwise, a stable work is not guaranteed. You can get rid of the suffix (Web, LMS etc.) if you edit the language.xml file, which is stored in the folder with the software is installed (C:\Program Files\iSpring\product_name\lng). In the meanwhile, after I posted my question, I had a look at all your solutions..nad maybe iSpring Suite DX can suit my needs. What do you think? Can it solve my (above) needs? I am very sorry that I do not have a better answer at this very point!